Just purchased a pair of KYB rear shocks for my 97. Looking to get standard and not lowering springs. (I actually plan to use my hatch to lug around music gear). Any pointers in the right direction would be greatly appreciated. 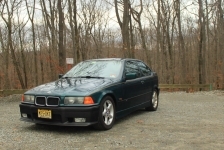 Best deal I've seen is on ebay for a used pair pulled from a 1996 328is with 120k miles, but not sure of compatibility. Thanks. 328is springs won't work. They're too long if I recall correctly. Shameless plug: I have one rear spring from my 318ti I'm willing to sell for $25 shipped. Let me know if you're interested in purchasing it. Is it a "non-lowered" spring? Might take you up on it if I'm able to find another that's sold by itself. It is the sport model spring from BMW. Lowered a few millimeters from the non-sport models. I may have a set of base springs from a 96 base for sale in a couple days, I'll keep you posted. Please let me know about the set. I have received the shocks but haven't been able to look for springs because I was in the middle of a move. Thanks.